Appendicitis refers to inflammation of the appendix. It is caused by direct luminal obstruction, usually secondary to a faecolith but may also be due to lymphoid hyperplasia, impacted stool or, rarely, an appendiceal or caecal tumour. It typically affects those in their second or third decade and there is a lifetime risk of 7-8%. In this article, we shall look at the clinical features, investigations and management of acute appendicitis. *No gene has been identified specifically but the risk is roughly three times higher in members of families with a positive history. The main symptom of appendicitis is abdominal pain. This is initially peri-umbilical, dull, and poorly localised, but later migrates to the right iliac fossa, where it is well-localised and sharp. Other possible symptoms include vomiting (typically after the pain, not preceding it), anorexia, nausea, diarrhoea, or constipation. On examination, patients may be tachycardic, tachypnoeic, and pyrexial. 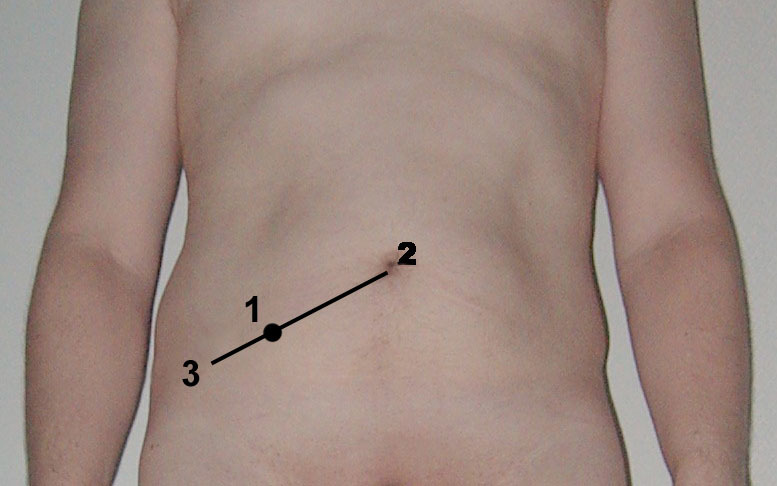 When examining the abdomen, the most specific findings are rebound tenderness and percussion pain over McBurney’s point (Fig.1), as well as potential signs of guarding (if perforated). An appendiceal abscess may also present with a RIF mass. Whilst the clinical signs alone have poor predictive value, when combined they can be very sensitive in the conditions diagnosis. The most important other diagnosis to consider in the younger female patient is gynaecological pathology, especially ectopic pregnancy or ovarian cyst rupture. Urinalysis should be done for all patients with suspected appendicitis to exclude any UTI or other renal / urological cause (albeit leucocytes can be present in those with an appendicitis). For any woman of reproductive age, a pregnancy test is also vital. Routine bloods, importantly FBC and CRP, should be requested to assess for raised inflammatory markers, as well as baseline blood tests required for potential pre-operative assessment. A serum β-hCG may also be taken, if ectopic pregnancy still has not been excluded. 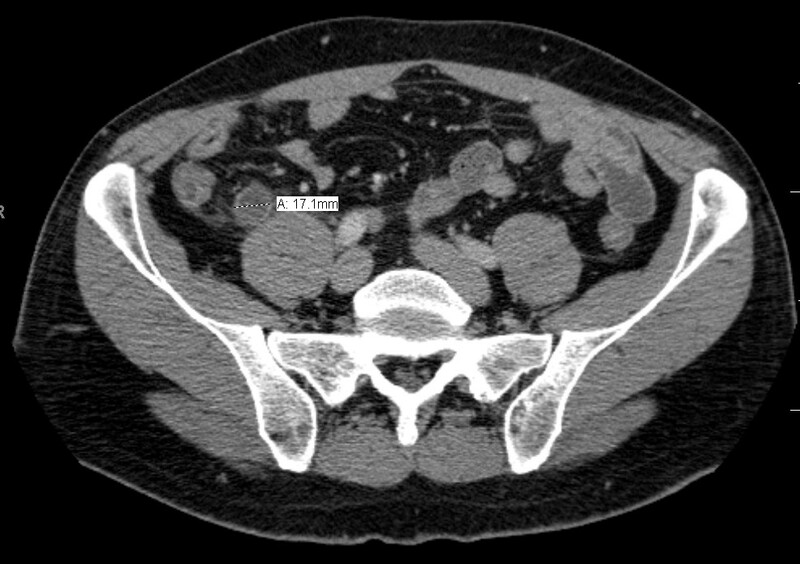 Imaging is not required to diagnose or treat appendicitis, as most cases should be a clinical diagosis. Several risk stratification scores have been developed in an attempted to assist in the diagnosis of appendicitis, based on clinical and radiological evidence. However, these scores, such as the Alvarado Score and the Appendicitis Inflammatory Response (AIR) Score, should only be used to assist the surgeon in their decision making and not replace their clinical judgement. The AIR score is a validated score (Table 1) that aims to triage patient into: low risk (0-4, no intervention required), intermediate risk (5-8, for inpatient observation or further imaging advised), high risk (9-12, surgical exploration recommended). Risk stratification scores are still not routinely used in clinical practice and ongoing research aims to appraise these scores for best practice. 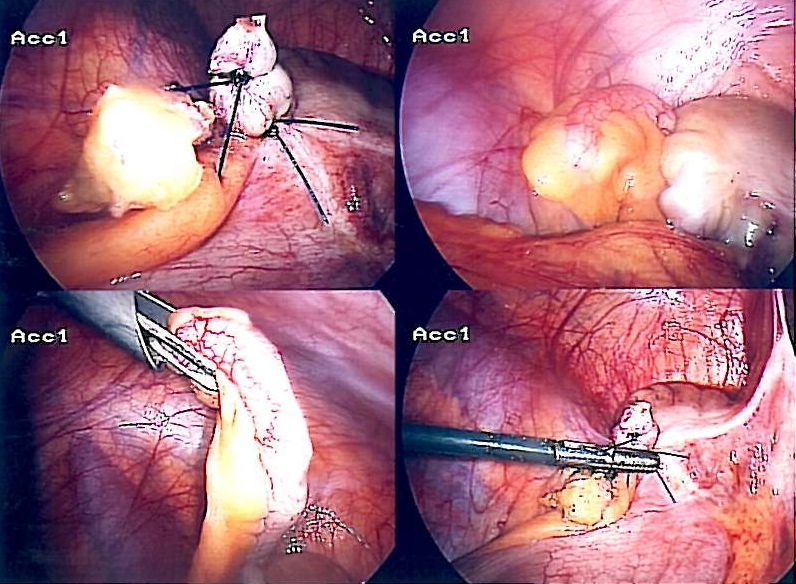 The current definitive treatment for appendicitis is laparoscopic appendicectomy. However, there is some debate surrounding the use of conservative antibiotic therapy in uncomplicated appendicitis; a recent Cochrane analysis found that whilst appendicectomy should remain the standard treatment for acute appendicitis, further research is still warranted*. Experience has shown that primary antibiotic treatment for simple inflamed appendix can be successful but has a failure rate of 25-30 % at one year. Laparascopic appendectomy* (Fig. 3) still remains the gold standard for treating appendicitis, due to a low morbidity from the procedure. In females it also allows for better visualisation of the uterus and ovaries. The appendix should routinely be sent to histopathology to look for malignancy (found in 1%, typically carcinoid, adenocarcinoma, or mucinous cystadenoma malignancy). As per any laparoscopic procedure, the entirety of the abdomen should be inspected for any other evident pathology, including checking for any Meckel’s diverticulum present. Follow-up with CT scan after conservative treatment is recommended in patients >40yrs, due to around 2% prevalence of concurrent malignancy. Psoas sign is associated with which position of the appendix? Which of the following statements is NOT true about pre-operative evaluation and management of appendicitis patients? A 22yr old patient is admitted with a 2 day history of abdominal pain. He reports it started centrally but now is focused to the RIF. He is pyrexial and has vomited twice. he has RIF tenderness and is Rovsing's sign positive. His WCC is 22.0 and CRP is 121, remainder of his bloods unremarkable. Which one of the following should not be part of your management plan?